This morning before class, the sky was like a gray soup; the air unusually chilly. Hours later, the sun shines, melting the early autumn coolness. Once again, it is summer. The power of the sun. Energizing. Warming. Nourishing us with light. Today’s satsang topic, Aditya Hrdayam, the Heart of the Sun, is all about this. How when we shine the light of presence and awareness, we are able to dispel the shadows, so that we might see ourselves in our fullness. How it is with such light that we are able to destroy our own egoic demons, just as Rama does the 10-headed demon Ravana, by calling on the powers of the sun. Over the last week, leading up to the satsang today, I have been chanting this hymn at the start of each class. And some students have commented that they feel something different when they hear it. I too feel something when I chant this. It’s like a clearing of the clouds in my mind and my heart, and having the warm sun shine on my face. Even in the foreign Sanskrit, the hymn has the power to move, touch, inspire–without even knowing the words or meaning. Perhaps the Aditya strikes an internal chord, we recognize in its vibrations our own heart and history, we recall some deep memory that we too, like the sun, are light beings destined to shine. The Heart of the Sun. PHOTO: Rest and shine. Students taking rest after led primary. It was a pleasure to share a part of the Ramayana with the students today. Excited that some have expressed an interest in learning the Aditya and reading the Ramayana! This makes me happy. Looking at the photos above, one cannot escape the physicality of the ashtanga practice. Yes, our bodies take shapes in space. Yes, we move up and down the mat, tumbling back and hopping forward. It can look acrobatic. It can look a bit–at times, a lot–like the play of a contortionist. And at times, we get stuck in this play, in what appears like a sportive drama. We get preoccupied with the form, in what the asana looks like, instead of what it feels like. But this too is a part of the “lila”– in Sanskrit, “lila” is used to (depending on the tradition) describe the play between the Divine and the human world, the Absolute consciousness and “prakriti” or nature. And this play exists for our benefit, for our own awakening, so that we may go beyond the drama, that we may go beyond the physical. And that all this play, this lila will lead us to remembering–to remembering who we are; that we are Conscious Soul-Full beings. PHOTO: Led Primary two Fridays ago here in Spirit Mysore Osaka. Spirit students embodying that beautiful play between the physical practice and deep personal work that inevitably happens along with it. Osaka, Japan. More than one month down, less than one month to go. Being in Japan, wandering the streets, unable to access the overabundance of information, which translates into–for a foreigner like myself, anyway–white noise, reminds me of Bill Murray in Sofia Coppola’s “Lost in Translation.” How he navigates Tokyo with a charming sort of disconnect. Despite the language barrier, teaching here, reminds me how universal the language of yoga is. And thank goodness, because my embarrassingly rudimentary Japanese just barely includes instructions on breath and straightening knees. My moments of Lost In Translation, well, they’re not too bad. If anything, they’ve been great opportunities for greater understanding . Two weeks ago, during Satsang, we looked at the word “surrender”–quite possibly one of the most overused and often misunderstood words that pours forth from the mouths of yoga teachers. I admit, I am a fan of this word! It works so well at capturing the spirit of letting go, of relaxing into the moment. In Japan, however, the word doesn’t translate so well. Telling a Japanese student to surrender can be a little confusing, especially when it translates to “kofuku” or “to give up fighting.” Translated thus, surrendering seems like a strange suggestion. Give up?! But why?! Another word, I’ve been told, that fits better is “yutaneru,” which means “to let it go.” In the yoga context it is the letting go of our tension and of our expectations and attachments; it is allowing for flow. In Satsang that Friday, I explained that surrendering is letting go of the ideas and the patterns that do not serve us–that we give up, not a fight, but all the things that limit us, that keep us from expanding. Truth: understanding surrender isn’t easy for any culture, for any person. We all have our holding patterns. It hasn’t been easy for me personally either. Surrendering is a constant challenge; and learning it has been at the core of my own yoga practice and life journey. Maybe that’s why student/teachers like myself keep going back to it. We know that’s what needs to be done, we also know that it’s pretty damn hard to really do it. We are all just learning. Grateful for the lessons in surrender here in Japan. Thank you to teacher and fab assistant Tomomi Takeuchi for sharing her spot-on translation of “surrender” in Japanese. 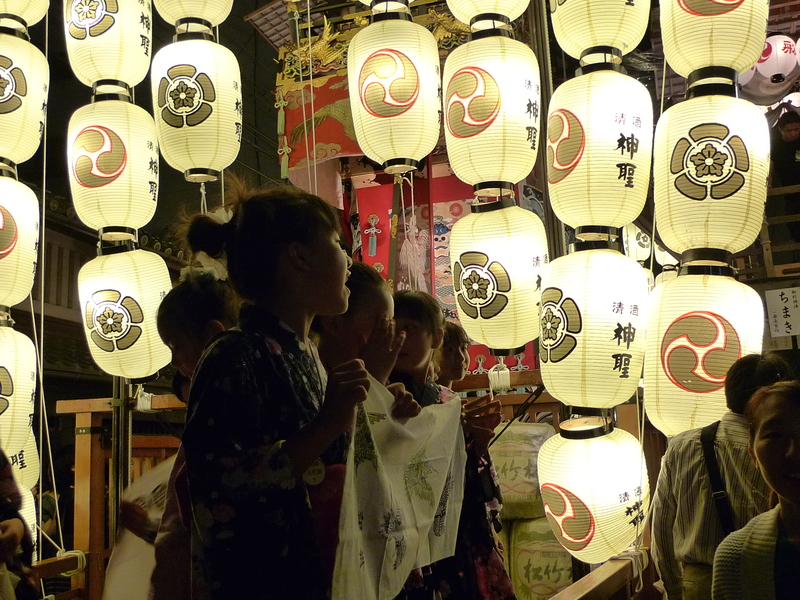 PHOTO: Gion Matsuri, Kyoto, Japan. It’s amazing how a great deal of work, deep excavation can happen so quietly. Inner dance can be wild, there can be a great deal of movement and noisemaking. Likewise, it can take on the subtle work. Participants dive inwards. The shifts are are massive tremors underneath the surface, with only some signs above ground. Facial fissures telling tales of secret journeys, openings. Release comes in tears. My experience here in Japan is that inner dance, which is evocative but profoundly quiet. Last Sunday’s ID was no exception. Felt particularly blessed to work with participants who I have been teaching nearly everyday for the last month. 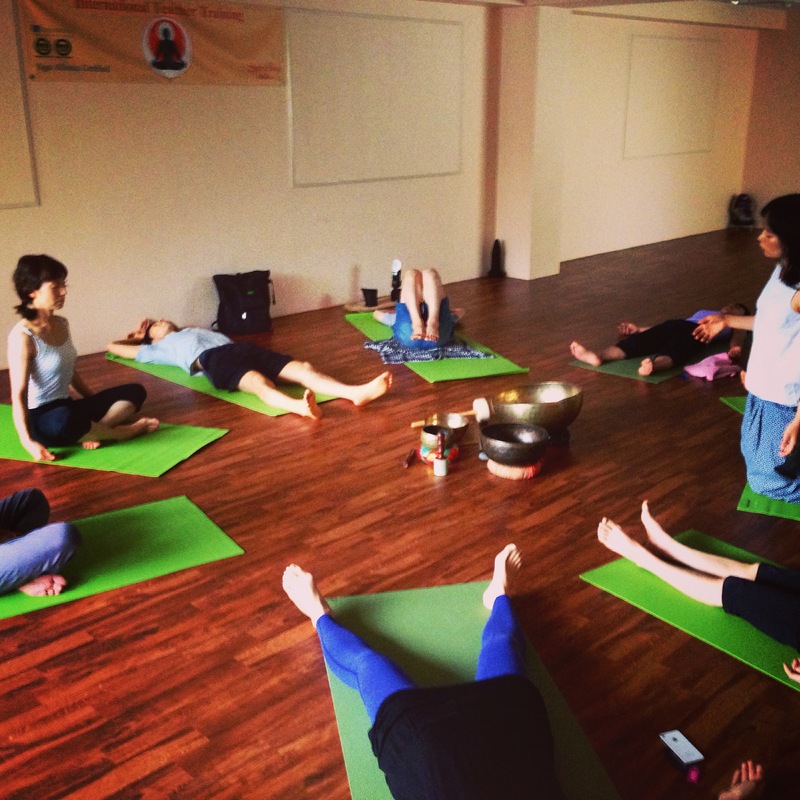 A Mysore program has it’s own special alchemy. Trust is there. So is the willingness to go deep. Feeling blessed that one tool can help support the other. That ultimately the goal is the same, remembering who we really are. PHOTO: Sacred Inner Dance Circle last Sunday, 27 July. 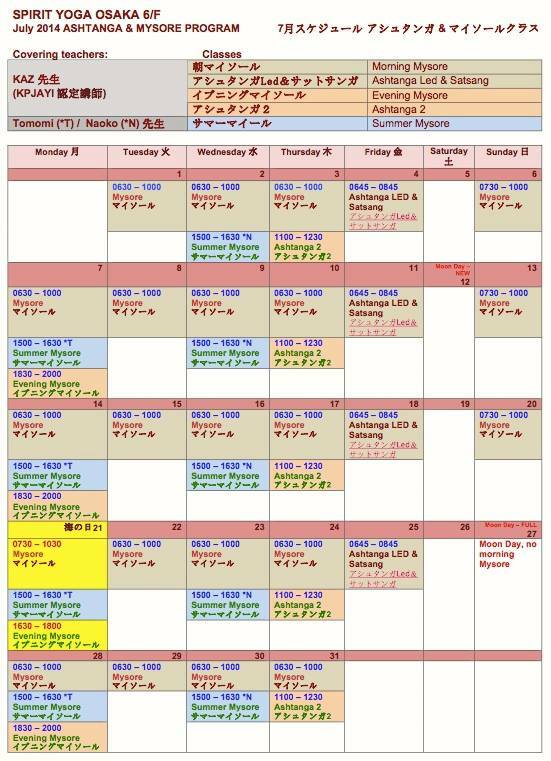 The next scheduled ID here in Spirit Yoga Osaka is Sunday, August 31, 11:30am-1pm. There may be no words, no looks. No exchange of names. No memories other than bodily shapes in space, movement, and breath. Yet, this is where we meet. This place where there is no dress code, no make up, there are no formalities. We are allowed to be ourselves, different and at the same time feel as if we are in perfect harmony, no matter what culture we hail from, what body type we have, what age group we belong to, whatever our range of flexibility might be, whatever our skill or talent or experience. We meet here: in this sacred space of unifying energy, sadhana, practice. 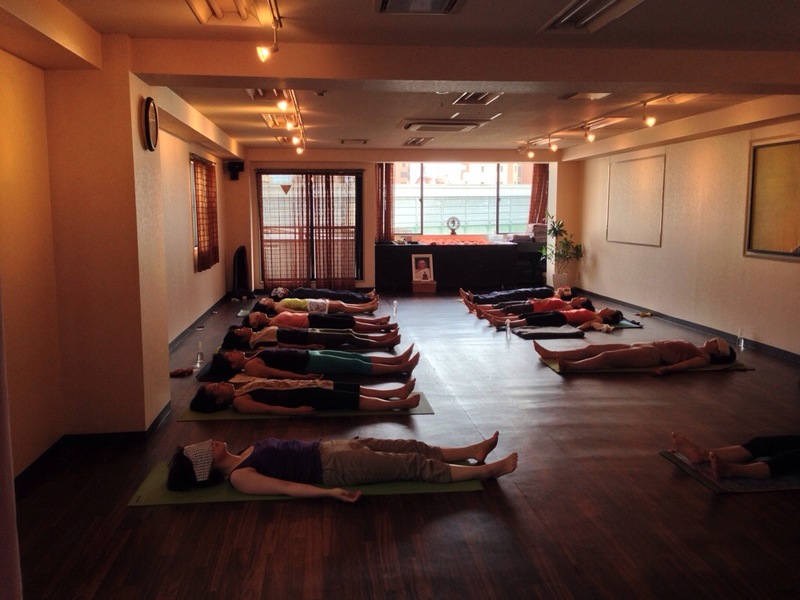 PHOTOS: Spirit Yoga Osaka, Morning Mysore. These images of Melissa and Naoko practicing remind me of the profound unifying energy of practice. The poetry of what happens in a mysore room. Soaking up the inspiration here in Osaka! I am in my second and last month of covering for Veronique Tan here in Spirit Mysore Osaka. 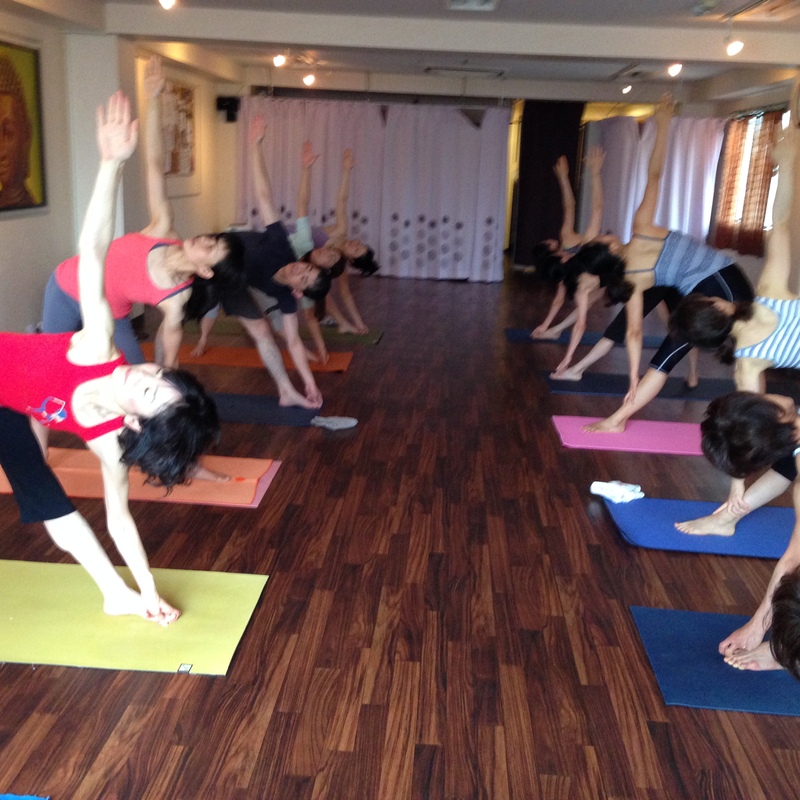 Mysore Morning schedule in August: Sunday 7:30am, Monday to Thursday, 6:30-10am. Friday 6:45am Led Primary, followed by Satsang. Friday morning led class is followed by Satsang here in Spirit Yoga Osaka. This is a time when the Mysore group can meet to practice other aspects of ashtanga yoga, whether it’s chanting or discussing yoga philosophy. Yesterday, July 4, 2014, was my first Friday here. It was a full power led primary; and I actually had fun counting the vinyasa-s! I particularly looked forward to discussing the Japanese word “ganbatte,” often translated as “Do your Best!” — which I realize can differ slightly in meaning depending on context. I wanted to explore “ganbatte” in the context of yoga and how I mean it when I say it in class. Here is a written expansion of yesterday’s talk. I ask the circle of students (with the help of Naoko-san translating) gathered after Friday’s led class what they feel when someone tells them: “Ganbatte.” Many nod in agreement that it is a motivation, a cheer to go on, to do better. Hiroko-san, sitting across from me, nods too but also adds that depending on the context it can also come with a lot of pressure. The Japanese are renowned for their work ethic and discipline, it is deeply ingrained in the culture–and beautiful to see when applied to the yoga practice. When taken to an extreme, it has a dark side. In Japan, karōshi, 過労死, or death from work, is legally recognized as a cause of death. People in their thirties have strokes or heart attacks due to working long hours and suffering from extreme stress–they’re just doing their best, right?! This, of course, would not happen with the skillful yoga students here attending class and practicing with great awareness. Still, it begs the question: What does it mean to do your best in the yogic sense? What does ganbatte mean for the yogi? Ganbatte is an encouragement, often translating to Do your Best! or Do well! or Be courageous! It is supposed to inspire courage. In her famous TedTalk on Vulnerability, my favorite researcher/storyteller Brene Brown speaks about how the root of the word courage comes from the Latin “cor,” which is the heart. That in its early form, to be courageous was to speak from one’s heart. These days we look at courage as bravery, having guts or gumption, daring to do what is difficult. All well and good. But to be truly courageous we must act according to what is true to our hearts as well, and from that place of authenticity we are able to act with greater awareness and equinimity. When we are true to ourselves, then we are in satya, one of the five yamas, the foundation of Patanjali’s ashtanga, or 8-limbs. Now: what is best exactly? We often confuse what is best for what we think of as what is perfect. We often look towards some future ideal or goal. In our yoga practice, we often think of perfection as the final expression of the posture the way we see it in some yoga video, on YouTube or on Instagram. Patanjali’s first sutra in the Yoga Sutras is “atha yoganusasanam.” Yoga is happening now. It does not look towards the future. It exists in the present moment. Never does Patanjali outline the particularities of what an asana looks like, he doesn’t go into degrees or alignment, but rather on each individual’s feeling in the pose. “Sthira sukha asanam,” The posture is both steady and easy. And this will depend on the truth of each and every person, as they discover the balance between strength and flexibility, steadiness and comfort. So wherever you truly are in your practice, so long as your put the right effort into finding that “sthira” and “sukha,” the right presence and awareness, no matter what the asana looks like, it is perfect for that particular moment. So: Gambatte! Gambatte!!! Practice with true courage, practice from the heart! That is already the best practice. 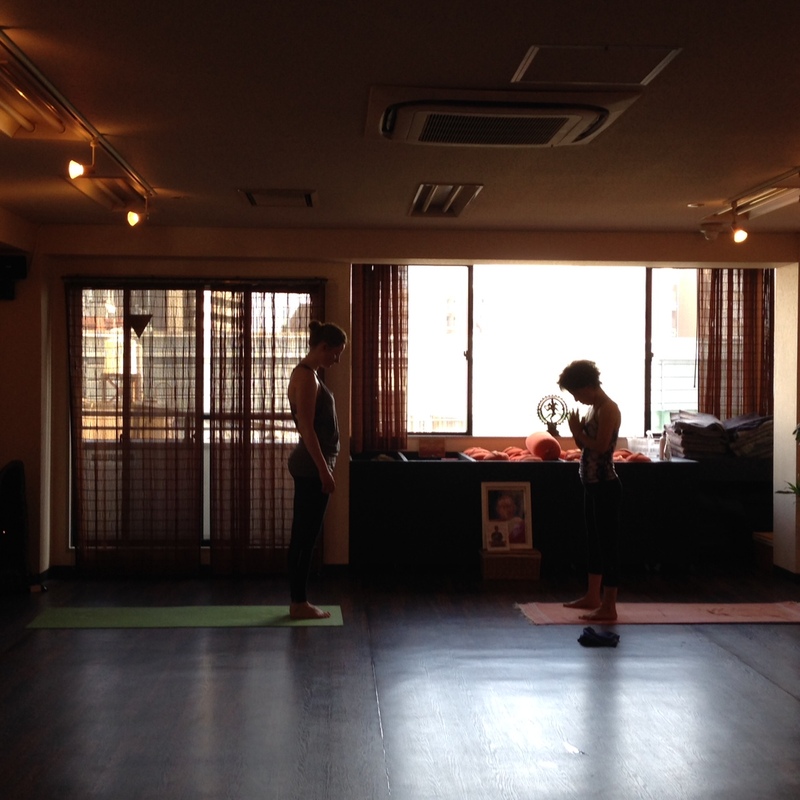 PHOTO: Friday’s Led Class here at Spirit Yoga Osaka.